From the author of One Pink Line cmes a story about letting go of the past and finding bravery in the depths of fear. Set on the sun-soaked beaches of Thailand and the rough waters of the Indian Ocean, The Unimaginable paints a vivid portrait of a young woman on a journey to find herself-and her harrowing fight for survival. After twenty-eight years of playing by the rules, Jessica Gregory moves from her small Indiana town to Phuket, Thailand. But her newfound routine is upended with the arrival of Grant Flynn, a captivating, elusive man who is sailing around the world while trying to move on from a past tragedy. 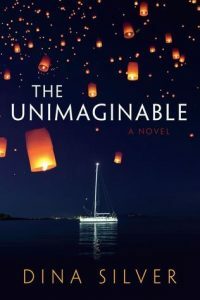 Jessica volunteers to help crew Grant’s boat, Imagine, on a passage across the Indian Ocean and finds herself falling in love with him as the voyage gets underway. But when disaster strikes, Jessica must summon her courage as the crew is confronted by unspeakable terrors-and, aboard a boat named for such promise, comes the unimaginable.